Going beyond borders to unite innovative centers of excellence is Cancer Core Europe’s vision: to effectively translate research progress to the clinic for the benefit of patients. Cancer Core Europe brings together the expertise and critical mass required to effectively move translational research into the clinic, bringing breakthrough discoveries to benefit patients at an appropriate cost. Providing an environment where basic, translational, and clinical research occur side-by-side in our centers means that patients can benefit directly from experimental findings. Likewise, observations made in the clinic inform research being carried out. Cancer Core Europe, with the support of patient advocates, embraces this patient-centered approach. Sharing is essential—the complementary expertise of each center will sustain a common infrastructure providing patients with access to cutting-edge therapies, targeted for each patient and including immune therapies. Collective efforts to pool information from clinical, environmental, genomic, imaging and immune biology databases, will transform clinicians’ and researchers’ approach to cancer research, thereby permitting a deeper understanding than any single center could achieve on its own. Dissemination of findings to the public and specialists and training the future generation of oncologists will contribute to improving cancer health in Europe. The German Cancer Research Center (DKFZ) is the largest biomedical research center in Germany (staff: 3000). Established in 1964, DKFZ pursues the mission to unravel cancer causes and mechanisms. In addition to its excellence in basic science, DKFZ has a track record of outstanding translational research, since 2005 consolidated into its dedicated clinical translation center - the National Center for Tumor Diseases (NCT) - in collaboration with the Heidelberg University Hospital together with the Heidelberg Medical Faculty and German Cancer Aid (Deutsche Krebshilfe). The NCT provides infrastructure and resources that integrate and support all of DKFZ’s and HUMS’s clinical and translational cancer research activities. DKFZ provides NCT with full access to its excellent research infrastructure and resources.Established in 1964, DKFZ is the largest biomedical research center in Germany (staff: 3000). Research activities concentrate on basic cancer research, disease modeling, and translational cancer research. DKFZ is an international leader in the areas of brain tumors, genome-based molecular stratification, and innovative radiation oncology. UKHD is one of the largest and most prestigious medical centers in Europe (11,768 staff). The highest standards of medical care are guaranteed by world-renowned professors, distinguished physicians and committed nursing staff. Heidelberg University Hospital is constantly developing new methods of diagnosis and treatment at the forefront of biomedical science for the benefit of all patients. AT NCT patient numbers are steadily growing and various therapeutic and preventive clinical trials, including investigator initiated trials, are developed and conducted. Gustave Roussy is France's largest cancer center, an international referral center for oncology, and an integrated center for patient care, research, and teaching that has been labeled a Comprehensive Cancer Center by the French National Cancer Institute, INCa (Institut National du Cancer). Gustave Roussy’s Development Plan for 2015-2020 provides a framework for a new cancer center model to create a center of expertise that is equipped with cutting-edge technology platforms meeting the challenges of molecular medicine and immunotherapy through research and development of early testing techniques. In pursuit of its ambition to provide comprehensive care that is focused on the individual, Gustave Roussy will combine these cutting-edge technologies with a more customized approach to take patient preferences into account. Gustave Roussy is defined by its compassion, commitment, creativity, dynamism and willingness to share its expertise--all for the benefit of patients. Every day at Gustave Roussy, cutting-edge research produces major advances to improve patient treatment. Our key mission is to innovate and increase access to innovative therapies for our patients. From fundamental research to technological innovation; from epidemiology to clinical trials; and from sociology to psycho-oncology: Gustave Roussy marshals all the skills which are essential to speed up discoveries in the field of oncology. This broad range of expertise is reflected the integrated research policy which brings together fundamental, translational, and clinical research, together with clinical practice. Armed with an entrepreneurial spirit, our researchers, clinicians, and caregivers are dedicated to making innovative discoveries that directly benefit patients’ lives. Karolinska Institutet has 7000 students in undergraduate programs and 2200 in postdoctoral programs and consists of 22 departments, 6 in basic biomedicine and the rest at the clinic. The clinical part of research and training is the Karolinska University Hospital, which has two sites (the former Karolinska Hospital northern site, and Huddinge Hospital southern site) including collaboration with three community hospitals. A new hospital building, New Karolinska Solna, is gradually employed during 2017 and 2018. 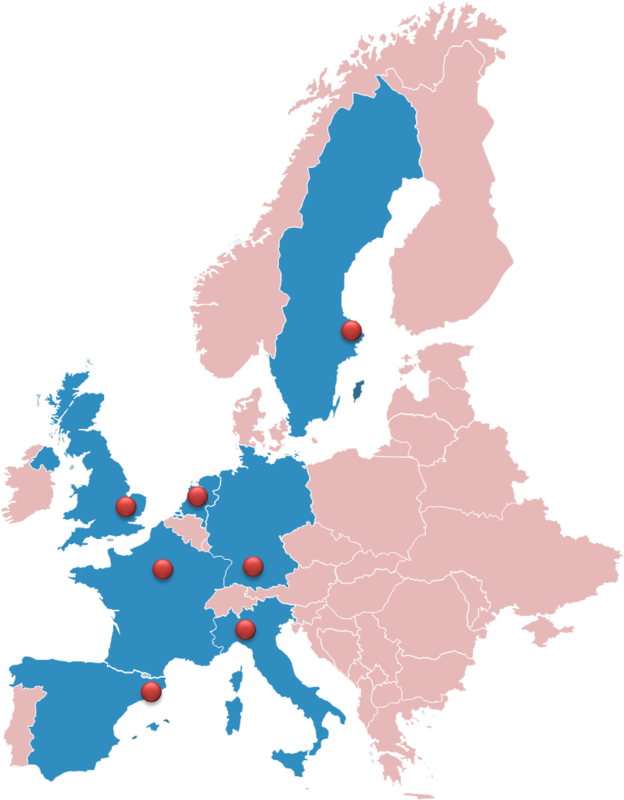 Basic preclinical research is located at the Karolinska Institutet Campus and some institutions at the Huddinge site. Clinical research regarding solid tumors and paediatric oncology is located at the northern site. Haematology is represented at both University Hospital sites. Overall, Karolinska Institutet has 16 programs to train medical and paramedical staff; apart from medicine and odontology, this also includes nursing, physiotherapy, biomedicine, toxicology, as well as other disciplines. Altogether 140 research groups with more than 800 members in twelve of the twenty-two departments are active in cancer research. The Netherlands Cancer Institute (NKI) has been at the international forefront of cancer care and research for more than a century. The NKI is a Comprehensive Cancer Center, officially accredited by the OECI, combining a dedicated cancer hospital (Antoni van Leeuwenhoek ziekenhuis - AVL) and research institute (Het Nederlands Kanker Instituut - NKI) under one roof in an independent organization with one Board of Directors. Combining health care and scientific research within the same institute offers a great, unique benefit for cancer patients. Specialized cancer care professionals work together daily in multidisciplinary teams to set up and carry out treatment plans tailored to the needs of individual patients, because no two tumors are alike. Cancer patients or patients referred for cancer diagnosis can come to our hospital, known as the Antoni van Leeuwenhoek, to make use of this personalised approach and the state-of-the-art research and treatment facilities. The hospital has 180 beds, an outpatient clinic and a large radiotherapy department. Facilities for clinical research include a comprehensive patient database, a large collection of tumor samples with extensive clinical data, other biobanks, a data center for clinical studies, extensive diagnostic facilities, a pharmacy with a GMP-certified production unit for experimental drugs and biologicals, large patient cohorts, and active research groups in pharmacology, epidemiology and psychosocial oncology. The research institute has more than 650 active employees investigating many aspects of cancer development, diagnosis, treatment and epidemiology. Scientists at the Netherlands Cancer Institute have access to state-of-the-art research facilities supporting their basic, clinical and translational research.